A mystery trader made a massive bullish bet on the S&P 500 on Monday, putting at risk hundreds of millions of dollars of capital. The bet is reminiscent of, and has drawn comparisons to, Warren Buffett’s giant bet on global stocks more than 10 years ago. The move is reminiscent of Berkshire Hathaway selling billions of dollars in index options premium between 2004 and 2008, before ultiamtely being bailed out by the Treasury and the Fed. It was a broad bet that the global market would rise over the next 15 to 20 years and, although initially the trade was made anonymously, it was eventually revealed to be Buffett's Berkshire Hathaway. Berkshire has netted over $4 billion in premium from the sale of these options, the final chunk of which is set to expire in 2026. 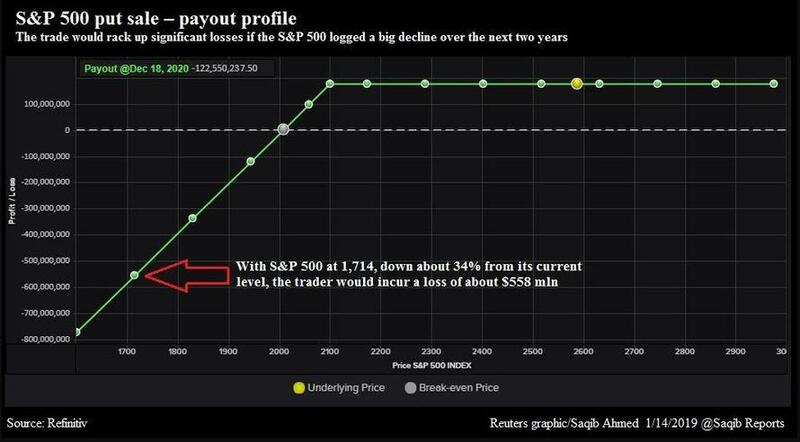 And even though Monday's bet was not nearly as big as Buffett's, it still could wind up costing the trader hundreds of millions if the market moves lower than the trader expects: should the market drop by 34%, the trader stands to lose about $558 million.